I was going to go with “Summer Beauty Essentials” but truth be told, these bits are not a necessity. At least not for most. Sun protection, of course, is a priority. 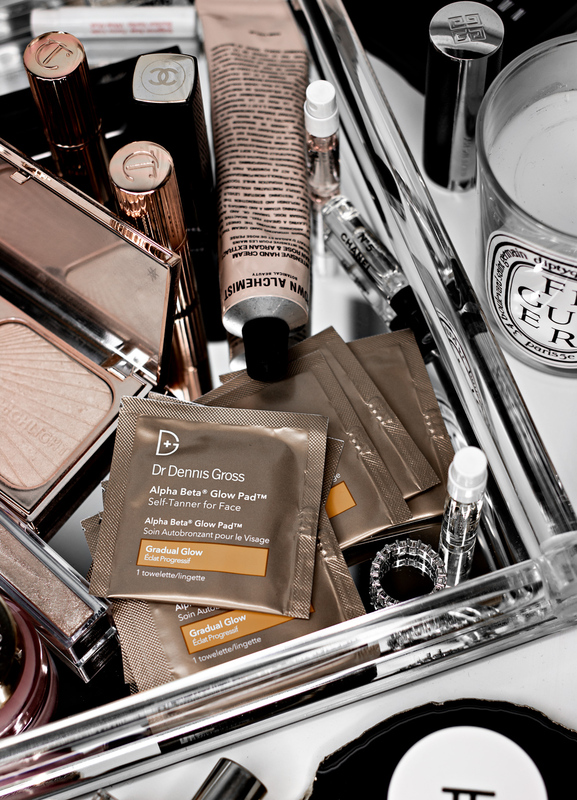 Even though I don’t tend to spend a lot of time in the sun, I still reach for SPF 50, rain or shine. I rotate between a few that work nicely with my sensitive skin like Moisture Milk SPF 50, MDSolarSciences Mineral Creme SPF 50, Missha Sun Milk SPF 50. I also pretty much always carry the Sunforgettable Brush On SPF 50 from Colorescience with me. The brush-on sunscreen really comes in handy when you want to grab dinner after work or something and don’t have time to re-apply your sunscreen, you can just brush it on top of your makeup. It definitely makes sitting outside in a restaurant and having dinner much more enjoyable when you don’t have to constantly try to hide from the sun (which is what I tend to do… even with the proper sun protection). Aaand if, like me, you don’t like being out in the sun but at the same time would like to add some color to your skin then you’d love QuickTan. I know I just mentioned it in one of my previous beauty posts, but it’s such a great and affordable product that it replaced my St. Tropez Mousse this year. QuickTan is easy to use (I apply it with an applicator mitt like this one) and gives a nice, natural color. The “natural-looking” part is always a struggle, but this works really nicely. 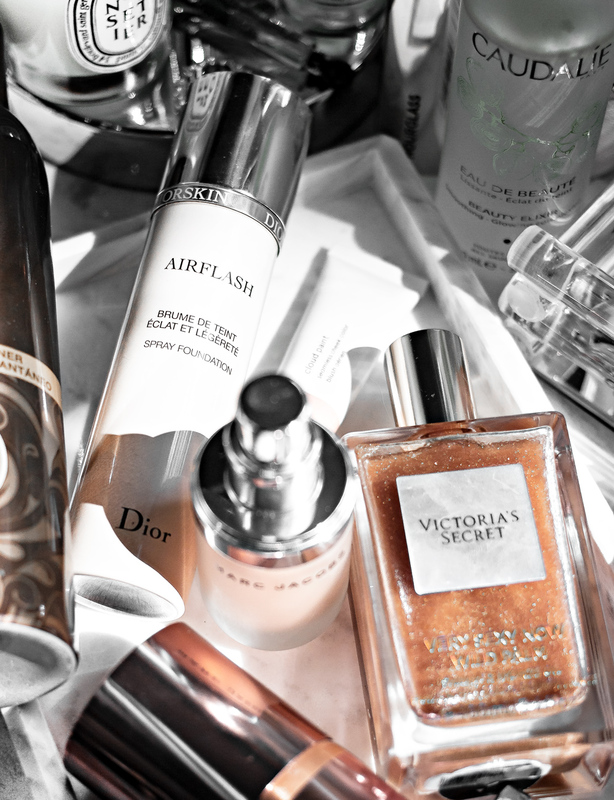 Keeping it very lightweight in the base department- always when it comes to summer beauty. Most days I actually go foundation-free and on those days it’s all about cream blush like Glossier’s Beam or Nars Liquid Blush in Luster and just a bit of bronzer. 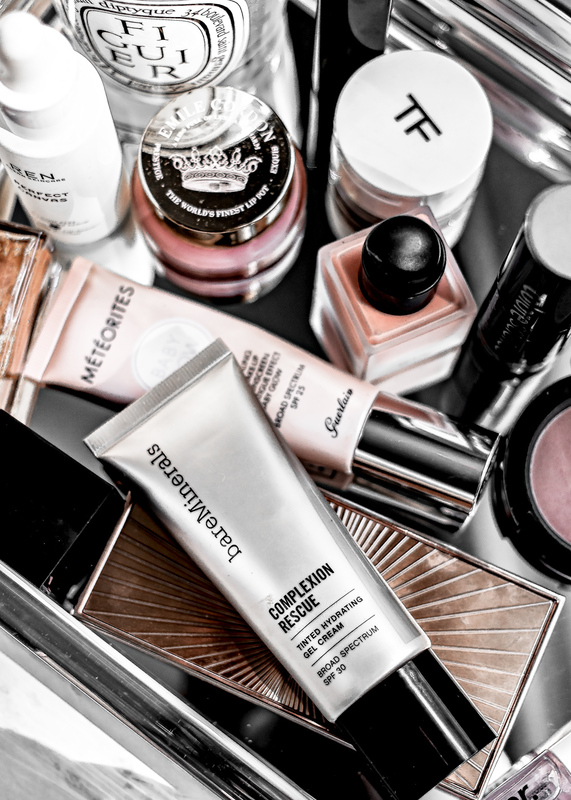 When it comes to foundation days, warm weather favorites are Bare Minerals Complexion Rescue, Guerlain Baby Glow Sheer Foundation, Dior’s Airflash and Chanel’s Vitalumiere Aqua. These are all very lightweight, sheer with a natural-looking finish- I hope and pray that Baby Glow in particular, never gets discontinued. Complexion Rescue is beautiful, but let me tell you, this is not a product you want to reach for when your skin is in a bad shape. My skin always freaks out when I travel but what I went through back in May was a whole other story (I blamed it on the climate change, then it turned out I was having a bad reaction to a change in medication dosage, sigh). It was the first time my skin broke out with cystic acne since going off Accutane. I was freaking out. One day I reached for Complexion Rescue when doing my make up. Big mistake. Huge. Flakes everywhere, the product just melted all over my skin, in other places it was clinging on to dry parts. It wasn’t pretty. Once my skin went back to normal, Complexion Rescue, once again, works beautifully with it. Kind of makes me question the product’s name though… Moving on! Adding just a drop of liquid highlighter to my body lotion always makes the fake tan look a bit nicer- especially in areas like legs, arms, and decolletage. Of course, I also love my shimmering oils as I said in this post, but sometimes, when it’s incredibly hot, they can feel a bit sticky when mixed with the heat, humidity, sweat. Also: face mists. Caudalie’s Grape Water has been a favorite for years; I love how fine the mist is, how refreshing it feels and that it helps calm down any redness and dryness. Their Beauty Elixir* didn’t agree with my skin for the first couple of uses back in winter, which might have been due to the essential oils in the formula. I do love reaching for it during warmer months though- so great for refreshing the skin throughout the day or for setting your makeup. Of course, there is also my all-time favorite, Mario Badescu’s Aloe, Rose and Herb mist. 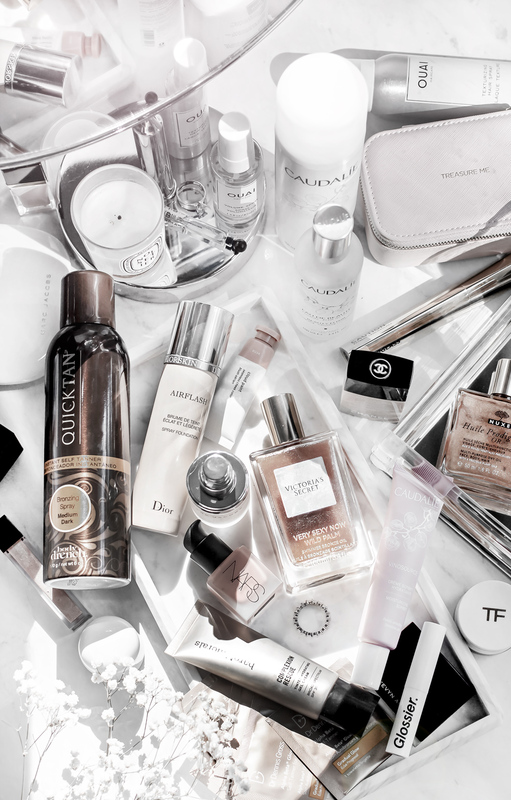 There are many beauty products that “come and go” but there are also quite a few that I remained loyal to over the years. One such product is the Alpha Beta Daily Peel from Dr. Dennis Gross Skincare. I’ve been using that peel since around 2013 and it’s definitely one of THE best skincare products I’ve ever used. I actually have a full review on it, BUT it dates all the way back to 2014, the photos in that post are quite cringe-worthy, some ingredients might have changed, so read it at your own risk. You’ve been warned. ANYWHO, the reason why I’m mentioning that beloved peel of mine, is because I also recently fell in love with their Alpha Beta Glow Pad face self-tanner. Now, I almost never use any self-tanning products on my face and was a bit hesitant about these, even though I love the original version. Let’s just say that after 3 days of using these, my husband, (who is the most amazing man in the world but sometimes tends not to notice things like me getting a haircut) looked at me and said: “wow your face looks so nice and glowy, where did you get a tan?” Yup. Just like my husband, Alpha Beta Glow is a keeper. There are no streaks, the tan is not very obvious or fake and orange-looking and works very gradually (I do use the “gradual” version, there’s also an “intense” version I haven’t tried) while leaving the skin feeling soft and smooth. No, it’s not every single day that I add a liquid highlighter to my body lotion and apply bronzer all over my decolletage. Good skin care routine and sunscreen are the real necessities, or should I say, summer beauty “essentials” here.